For a long time, crowdfunding was a tool to be used by the aspiring filmmakers and artists who had no other means to raise capital but through friends, family, and hopes. Individuals or teams could use platforms like Kickstarter or Indiegogo to ask for donations in exchange for their finished work when it finally became funded and created. The industry was so saturated by these aspiring creatives that the standouts were easy to spot. Zach Braff, Spike Lee, Veronica Mars. They got the press, the donations, and – often – the criticism. Crowdfunding was seen as an opportunity to get funded by those who had no other access to funds and the successful were often seen as intruders. In short, it was an industry built on help and support, not on profit and loss. However, with more than 1,250 active crowdfunding platforms, millions of global users, billions of dollars raised, and maturing markets growing in unprecedented numbers, it’s a technological revolution. Why would Goldman Sachs take such a strong stance on crowdfunding? 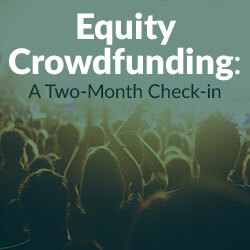 Because, on June 19, 2015, Regulation A+ went into effect, legalizing equity crowdfunding in the United States and bringing radical new opportunities to both sides of the table, for entrepreneurs and investors. Up until then, unaccredited investors generally could not invest in private companies. Now, for the first time, entrepreneurs (radical visionaries and hardened professionals) can raise up to $50 million in private financing directly from the unaccredited crowd without having to navigate the more traditional routes of angel investors or venture capitalists. StartEnginereceived $28.7 million in solicitations of interest on behalf of a car manufacturer, Elio Motors. SeedInvest, another crowdfunding platform, helped WayBetter hit their goal of $9.3 million in 48 hours ($11.4 million to date). But is it really as good as it sounds? Like everything else, yes and no. Yes, it’s real interest. No, it’s not real money. While Regulation A+ is a huge (and very exciting) leap forward, it is not the final answer. The slow wheels of the Securities and Exchange Commission (SEC) continue to grind until Title III and the rest of the JOBS Act are fully enabled. Until then, we have to work through some kinks. Let’s look at the WayBetter campaign. $9.3 million is a chunk of change but it’s not yet a true investment. It is, instead, an “indication of interest” from a perspective investor to invest. What that means is that organizations such as WayBetter can “test the waters” by creating a campaign on a platform like SeedInvest to gauge public interest. The investors, for their part, commit to investing a certain amount in exchange for a certain number of shares; however, no funds or shares are immediately exchanged – they are simply expressing their interest. After raising several million dollars, and proving that the public has an interest in investing, WayBetter, Elio Motors, and the other early “Reg A+” campaigns can begin the legal, accounting, and compliance audits process necessary to file for, what is basically, an IPO with the SEC. No one knows the answer to this yet, since no company has completed the process and come out the other side as a shining example or cautionary tale, but, based on human nature, we can probably make a safe assumption as to what will happen. When the time finally comes to pull out their credit cards, some investors will get cold feet and pull out, many will invest about as much as they had promised, and a few – excited by the recent press and momentum – might double down. All in all, the company might end up with a smaller investment round than they had originally expected but it will certainly be much more money than they had before and much more than they ever could have raised before June 19th, 2015. While there are certainly ways that the process can be streamlined and smoothed out moving forward, looking back over the first two months of equity crowdfunding it’s safe to say that Goldman Sachs appears that it was right, crowdfunding might very well be the next great finance model. We are truly on the brink of a technological revolution that will enable entrepreneurs to craft a better future for all of us and, for the first time, all of us can be with them every step of the way. 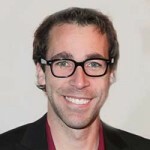 Chris A. Harvey is an attorney for entrepreneurs and practices law out of Silicon Beach. 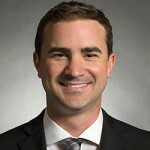 Chris represents a variety of business interests ranging from venture backed startups to emerging growth companies. In a past life, Chris worked as a web developer.